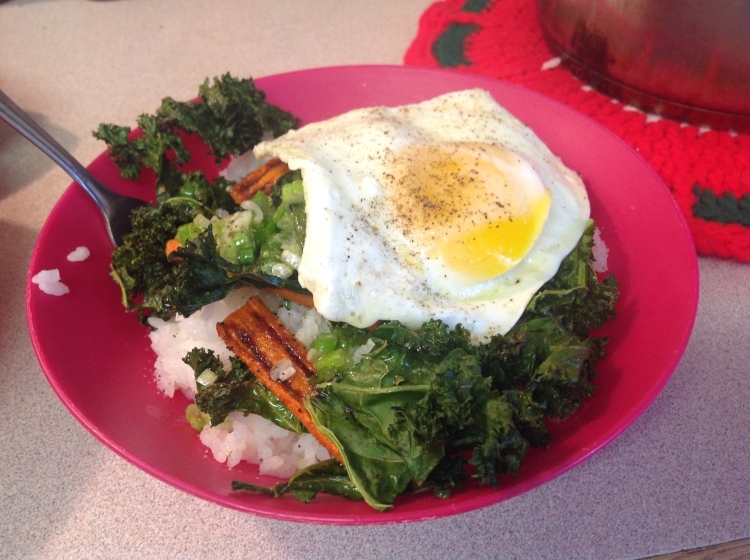 This healthy combination of flavorful roasted veggies over rice, topped with an egg, is a great example of what a vegetarian rice bowl can be. Nutty brown rice is perfect for this dish, but plain white rice is good, too. The flavors in the original recipe come from a bold Middle-eastern spice mixture called za'atar, a mixture of thyme, ground sesame seeds, and powdered sumac. I can't get za'atar, or sumac, at my local grocery store, and it seemed kind of pricey online, so I did some research and come up with my own faux blend. To be honest, I have no idea how close this is to the real deal, but it was pretty tasty. To make faux za'atar, combine 3 tsp dried thyme, 1 1/2 tsp lemon pepper salt, and 1/4 tsp toasted sesame seeds in a spice grinder and pulse into a powder. This should make about 2 Tbl. Use what you need for the recipe, and then keep he remainder in an airtight container. Now let's get started on the dish. 5 carrots, peeled, halved crosswise, then halved or quartered lengthwise to create uniformly sized pieces. With an oven rack in the upper middle position, preheat the oven to 375 degrees F. Line a rimmed baking sheet with parchment paper and set aside. Toss the carrots, 1 Tbl oil, za'atar, 1/4 tsp salt and 1/8 tsp pepper together in bowl. Spread the carrots onto the prepared baking sheet and cover with foil. Roast in the oven for 20 minutes. In the meantime, toss together the kale, 1 Tbl oil, 1/4 tsp salt, and 1/8 tsp of pepper together, using the same bowl as the carrots. (Why dirty more dishes than you need to?) Next, whisk together the vinegar, green onion, and 3 Tbl olive oil in a bowl to make a quick vinaigrette. Season with salt and pepper to taste and set aside. When the carrots are done roasting, remove the foil and spread the kale evenly over the top. Return the carrots and kale to the oven and continue to cook, uncovered, until the carrots are spotty brown and tender and kale is crisp, about 15 minutes. In the meantime, divide the cooked rice into individual serving bowls, about 1/2 cup per bowl. Top with the roasted vegetables and drizzle the vinaigrette over the rice and veggies. Cover and set aside. Heat the remaining oil in a 12-inch skillet over medium heat until shimmering. Crack the eggs into two small bowls, 2 eggs per bowl, and season with salt and pepper. Working quickly, pour the eggs into the skillet, cover, and cook for 1 minute. Remove from the heat and let sit, covered, for 1 to 2 minutes more, depending on how runny, or set, you like your yolks. Top each bowl with one egg, and serve. Takes about 45 minutes to make.